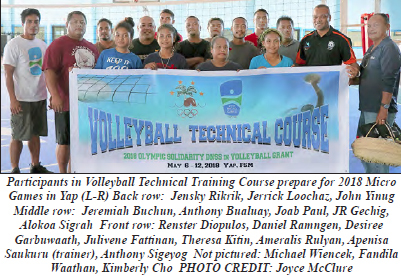 Colonia, Yap—Volleyball and beach volleyball technical training is on the calendar the week of May 6th in Yap as expert instructor Apenisa Saukuru of Fiji trains aspiring and experienced referees in how to officiate and coach teams during the lead-up to the 2018 Micro Games. Participants who complete 25 hours of training will be awarded certification. The FSM National Olympic Committee is the sponsor of the training thanks to an IOC Development of National Sport Structures grant of $30,000. In addition to the overall cost of bringing Saukuru to the island for nearly three months prior to the Games, the FSMNOC is also using the grant to bring volleyball coaches from Chuuk, Kosrae and Pohnpei to join the Yap volunteers as they prepare for the popular sport that will have teams from all ten delegations participating in the competition. Saukuru is a former Pacific Games Gold and Bronze medalist and Asian Volleyball Confederation certified referee with approval by the Federation Internationale de Volleyball, the governing body of Volleyball, to be the Expert Instructor.